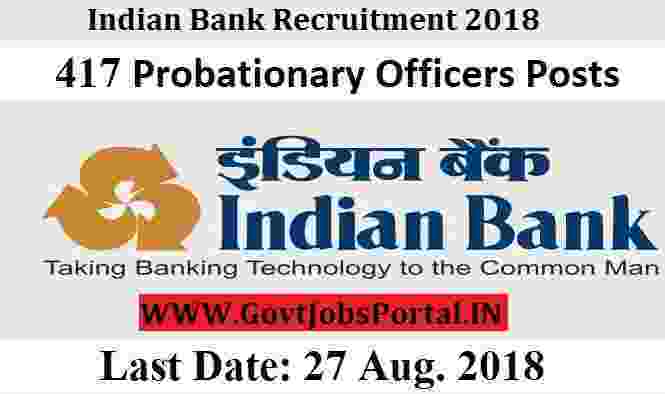 Indian Bank invitations for all Indian candidates to apply for Indian Bank PO Recruitment process 2018. Online proposal is out for young and bright graduates who fulfil all the eligibility standards specified in the official PDF file related to this Indian Bank PO Recruitment 2018. Applicants who are interested in making a Banking career can apply for this one year Post Graduate Diploma in Banking and Finance (PGDBF) course at Indian Bank Manipal School of Banking (IBMSB). After the completion of the course candidates will be recruit as a Probationary Officers in various Bank Branches all over India. Applicants will be carefully elected through a selection process consisting of online Exam (Preliminary & Main Examination) followed by Personal Interview. More information related to this Indian Bank PO Recruitment process is given below in this article. Read the complete article carefully before applying online for these Bank jobs in India 2018. Number of Vacancies: 417 Posts. What is the Eligibility Criteria applying this Indian Bank Recruitment? Educational Criteria: Indian candidates who have completed their Graduation in any stream or any trade from a well-recognized university can apply for this Indian Bank PO Recruitment 2018. Age Bond: The age limit for applying these Bank jobs is in between 20 years to 30 years. Those who lies in between this age criteria can apply for these Bank jobs in India. Candidates can pay the above application fee through the online mode using “ Net Banking, Credit card, Debit card or any other online payment mode”. What is the Procedure for applying these Indian Bank PO Recruitment? Those who are eligible for these Bank jobs in India can use online for filling the online application form. Below we share the complete steps on how to apply online through the official website. 1. Visit to the Official website: “ www.Indianbank.IN ”, candidates should select the following Link from the MENU ―>>Careers―>>RECRUITMENT OF PROBATIONARY OFFICERS THROUGH ON BOARDING ―>> APPLY ONLINE FOR PO ON BOARDING‖. 2. New Applicants have to click on ―NEW REGISTRATION tab to register their fresh application. Fill up the complete application form by entering their basic information. Applicants are advised to sensibly fill in the online application from by themselves as no modification in any of the data filled in the online application will be possible. 3. Applicants have to upload their photo & signature as per the specifications given in the Guidelines for Scanning and Upload of Photograph and Signature (Annexure). 4. Prior to submission of the online application form applicants are advised to use the “SAVE AND NEXT” button on the online application form to verify the details in the online application form and modify the same if required. Once you click on the Submit Link, No change is permitted after FINAL Submission. 1st Aug. 2018 is the Starting Date. 6th Oct. 2018 is the Pre-Exam Date. 4th Nov. 2018 is the Date of Mains Exam.